Educational Developments is the magazine of SEDA. 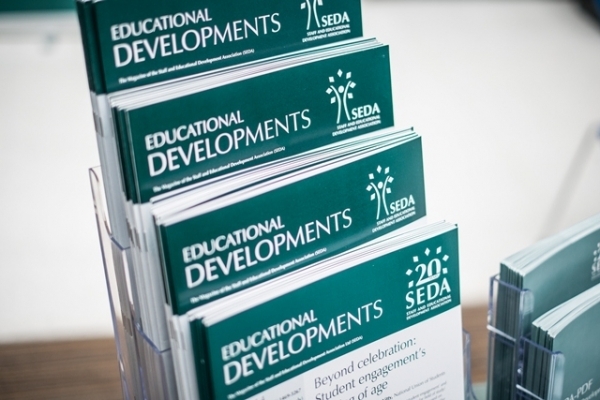 Four times a year it brings you topical articles, reviews of books and online resources, and news about SEDA. Past issues of Educational Developments are available to view on this website. Past issues of the New Academic magazine (the predecessor to Educational Developments) can be viewed on this website. See Educational Developments Editorial Committee for a list of current members. Submission of an article to Educational Developments implies that it has not been published elsewhere and that it is not currently being considered for publication by any other publisher or editor. All material should be submitted to the Editorial Committee via the SEDA Office, in electronic format. Everyone involved with Educational Developments works on it only part of the time and so please be patient if it takes some time to process your submission. All papers will be reviewed by at least two people and expert advice sought where appropriate. The Editorial Committee of Educational Developments welcomes contributions for consideration on any aspects of educational development likely to be of interest to readers. The audience is drawn from educators in all fields and disciplines. You should therefore not assume specialist knowledge, but write clear, straightforward accounts in plain English. When describing projects, please give concrete detail. Articles accepted for publication may be subject to editing. All authors will receive a copy of the issue their article is published in. For further guidance on submission see the contributor guidelines . If your article is accepted and published in print form (online versions of the magazine are available one year after printed publication) you are welcome to scan the article as a PDF and place it within your own university’s repository. Each issue of Educational Developments carries several reviews of learning resources (books, websites, conferences, multimedia materials) of between 200 and 400 words each. The Editorial Committee is keen to build up the list of people who are interested in reviewing for the magazine. Please email office@seda.ac.uk for more information. Copies of the magazine will be included as a benefit for all categories of SEDA Membership; associate and individuals receiving one copy, institutional members receiving packs of 10. If you would like to receive additional copies or subscribe to the magazine separately please click here for a copy of the subscription form. UK Subscription rates for Volume 20 (2019) are: £40 sterling for the 4 issues. Overseas subscribers should add £5.00 sterling per set for postage and packing to Europe and £8.00 sterling for postage and packing per set to the rest of the World. Multiple subscriptions in sets of 10 can also be purchased at a cost of £290 per set.